Welcome! I’m G. Elliott Morris, data journalist for The Economist and blogger of polls, elections, and political science. Happy Sunday! 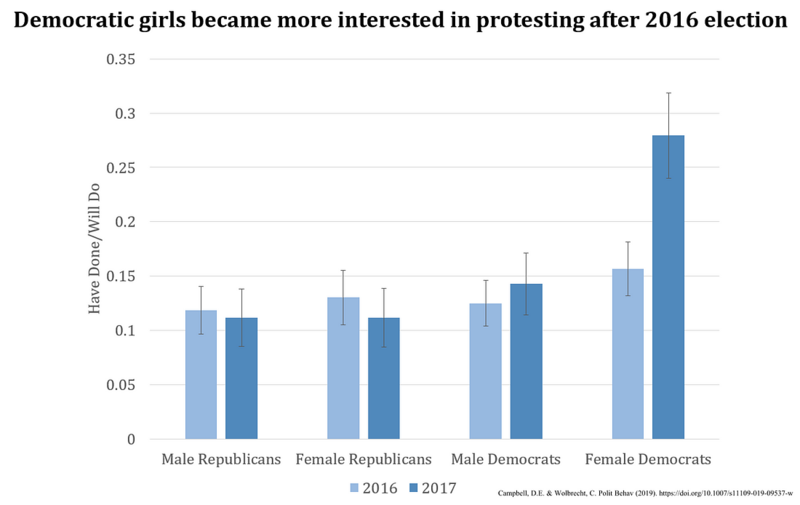 Here’s my weekly newsletter with links to what I’ve been reading and writing that puts the news in context with public opinion polls, political science, other data (some “big,” some small) and looks briefly at the week ahead. Let’s jump right in! Feedback? Drop me a line or just respond to this email. This newsletter is supported by subscribers on Patreon. A special thanks to those who pledge the top two tiers is written in the endnotes. If you enjoy my personal newsletter and want it to continue, consider supporting it on Patreon for just $2. How much does Trump’s approval rating matter? The number has been very predictive of ballot box behavior in recent years. What could low approvals mean for 2020? A new NBC/Wall Street Journal poll out today finds President Trump’s approval rating to be 46%, the highest in their polling since last October. To be sure, his approval rating in the aggregates is closer to 42%. But either way, this speaks to two things: First, that Trump has recovered some ground since his fiasco shutdown showdown over funds for the southern border wall, and second that his supporters and critics remain at about their equilibrium point for whenever he’s not doing something… outlandish. Perhaps more importantly, the pollsters for NBC/WSJ found that about 41% say they will vote for the President in next year’s election. The similarity between these numbers matters — an observation I’ve made repeatedly over the past few days. Let’s explore the gap between Trump approval and voting behavior over the past few elections, and talk briefly about partisan loyalty. 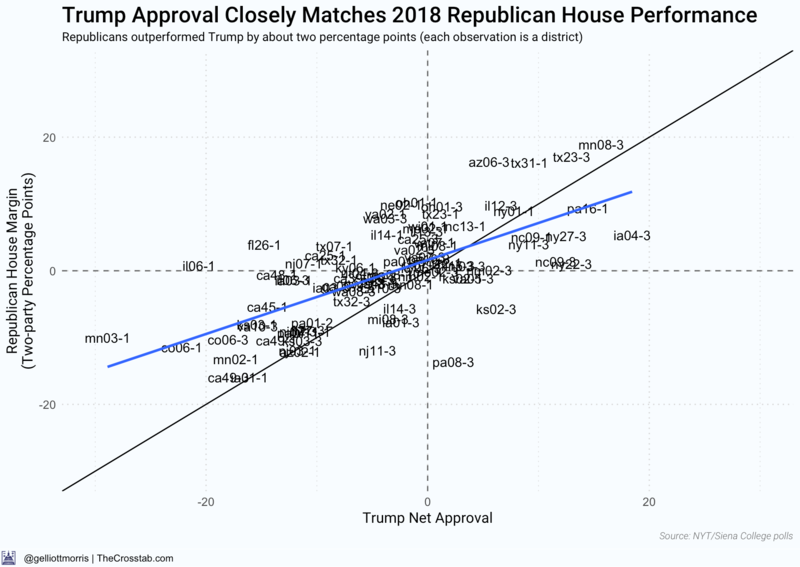 In the 2018 House elections, Republican candidates performed roughly equally to their district’s net approval of Donald Trump. 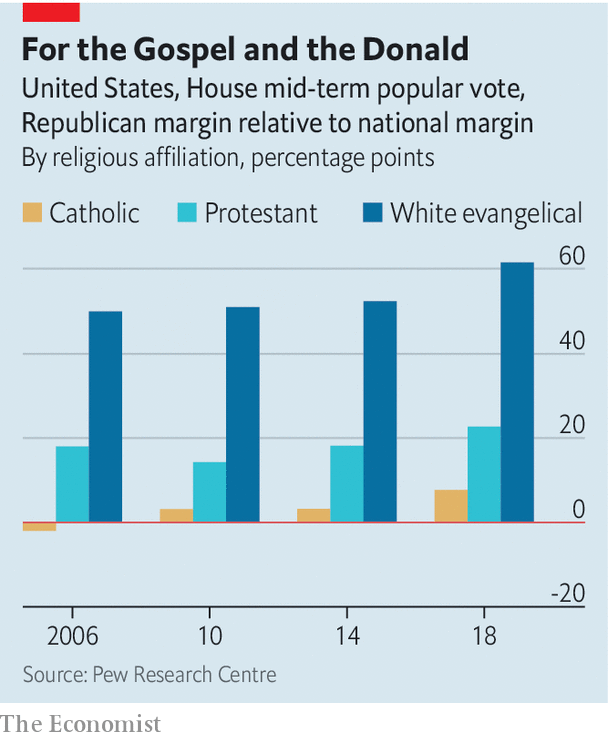 Importantly, they actually outperformed the president; On average, House Republican candidates did about two percentage points better, at least in the NYT Upshot’s district-level polling conducted with Siena college. 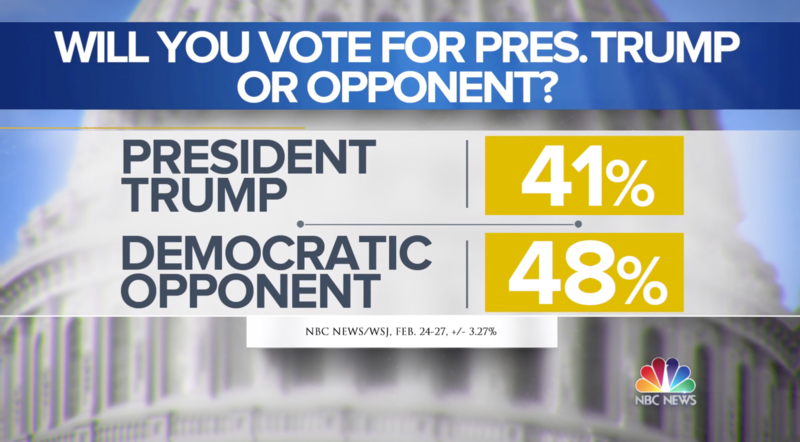 This is proof that the similarity between Trump’s approval rating and Republican voting patterns observed in the today’s NBC/WSJ poll — and in common sense, frankly — is not just a fluke. If you approve of the president, you’re very likely to vote for him. The point is that we have real-world evidence that the link between the two exists. It should be noted that the average GOP outperformance of Trump’s approval rating doesn’t necessarily mean that the president has pull among votes who disapprove of him. Rather, the average Republican is just more popular than the president. In fact, if anything, the evidence says that Trump has less pull among a group of supports who somewhat approve of his performance, rather than strongly approving of it. In YouGov’s polling for The Economist last year, those strongly approving of president Trump supported Republican candidates by a margin of roughly 90 percentage points — but the somewhat approvers supported Republicans by just 65 points. When Trump does something unpopular (that goes beyond the normal low appeal— take the shutdown as an example yet again) it is these weakly loyal voters that move out of his lane. Importantly, it has been the pattern of the cycle that they eventually merge back in. At any rate, it’s the district-level data that offer evidence to our original point: that Trump approval does constrain voting intention. Where else can we look? The figure shows a weakening relationship between consumer sentiment and presidential approval. While voters used to ascribe a lot of meaning to the economy — a la “It’s the economy, stupid” — there’s essentially 0 correlation between the two variables now. 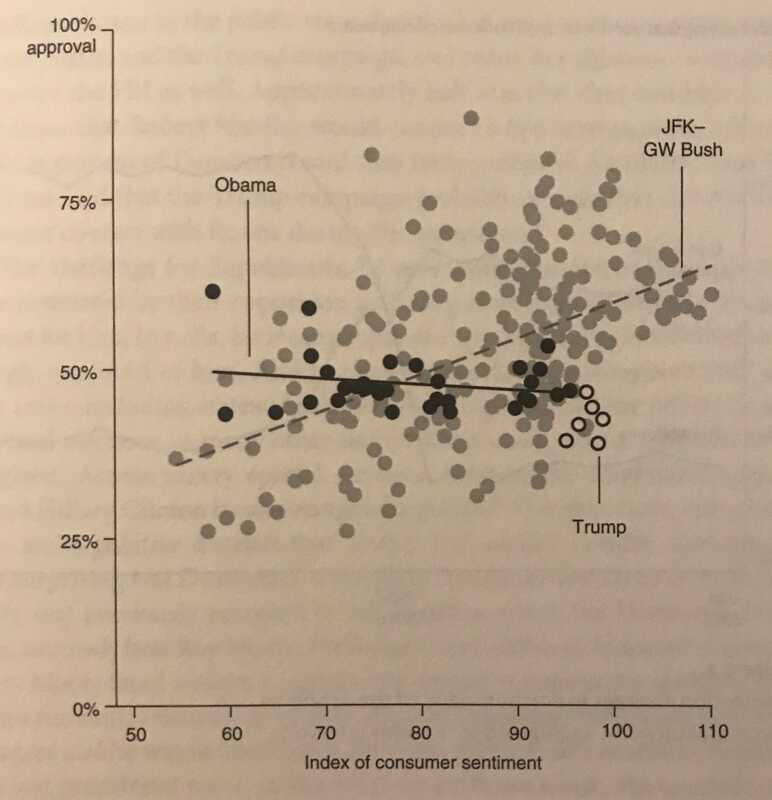 This reveals the changing way that voters evaluate the president, likely caused by the increasing reliance on partisanship when making political decisions. You can see this in data from the Pew Research Center: Republican opinions about the economy surged the very month that President Trump was inaugurated, while Democrats’ outlook sunk (although the effect was about 40-50 points larger among Republicans). The point? We’re relying more on opinions about the president, driven by our partisanship, when we're making our decisions in the voting booth. This is not just a Trump effect, for what it’s worth, we’ve been talking about the binding effects of partisanship for quite some time; recently, I picked up a copy of Gabriel Lenz’s Follow the Leader? 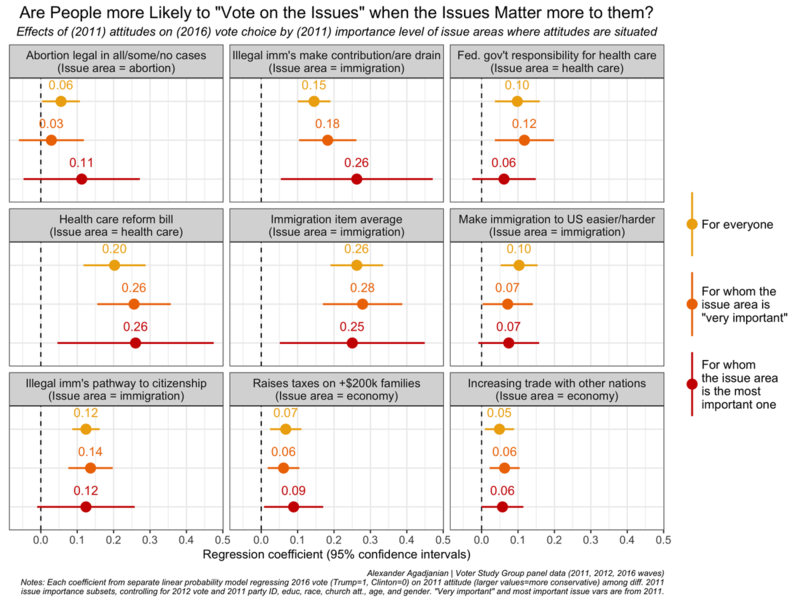 How Voters Respond to Politicians' Policies and Performance, which made a lot of the same points a decade ago, and Geoffrey Cohen published his “Party Over Policy” nearly twenty years ago. 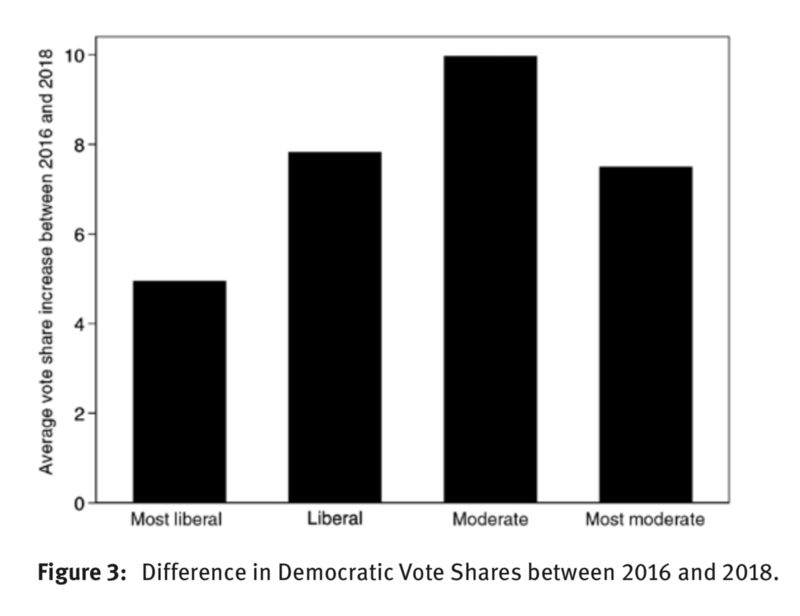 For example, Lenz finds that only 20-40% of Americans hold stable policy preferences, so when they 60-80% that don’t discover their party’s stance on an issue, they tend to adopt it. To be sure, recent research (that I talked about here last month) finds that Trump is a strong example of this “follow the leader” effect, but again, he’s not the first one. This all just to say that partisanship means approval ratings will be more predictive of voting behavior than they have been in the past. (You’ve heard this one before.) 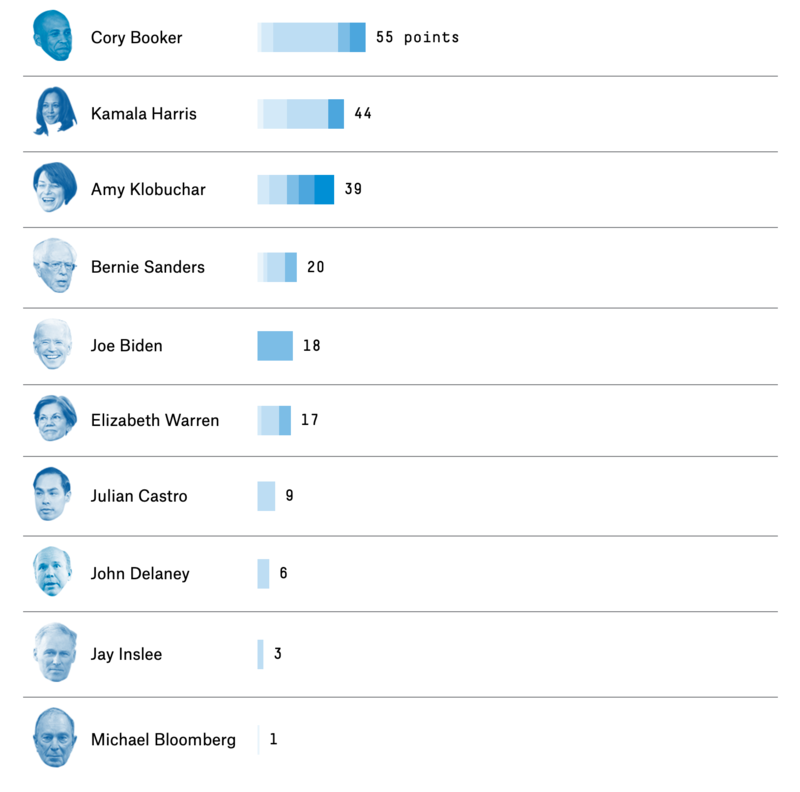 Trump’s base of support is not large enough to win the 2020 election alone. At best, it seems to measure about 35% (under normal economic conditions — a recession could break the pattern between the economy and presidential approval I just wrote about and push his approval lower) and at worst it could be lower. That’s based on his approval during the summer to fall of 2017, when Trump and Republican legislator’s attempts to repeal the Affordable Care Act (which were unsuccessful) and decrease the proportional tax burden on the wealthy and super rich (which were successful) pushed his approval to 36 percent, according to FiveThirtyEight’s house-adjusted average of polls. “But Trump won when his favorability was super low,” you might be thinking. That’s true; but approval ratings are different than favorability, especially since Hillary Clinton’s were also abnormally low in 2016. How high does Trump’s approval need to be to win re-election? Because I can’t help myself, I’ve decided to crunch the numbers. Following this exercise, if the election were held today with Trump at 42% approval rating (the number in the 538 average), he would likely win only ~ 40% of the vote. This would put Trump at a huge disadvantage in the electorate college, with Democrats picking up 10 states over 2016 and a certainly winning an Electoral College victory. But... it is pretty hard to believe that this is all that likely, given that Democrats only picked up five states (once you impute the House popular vote in uncontested seats) with a D+9 popular vote in 2018. The presidential election is likely to be much closer than that. 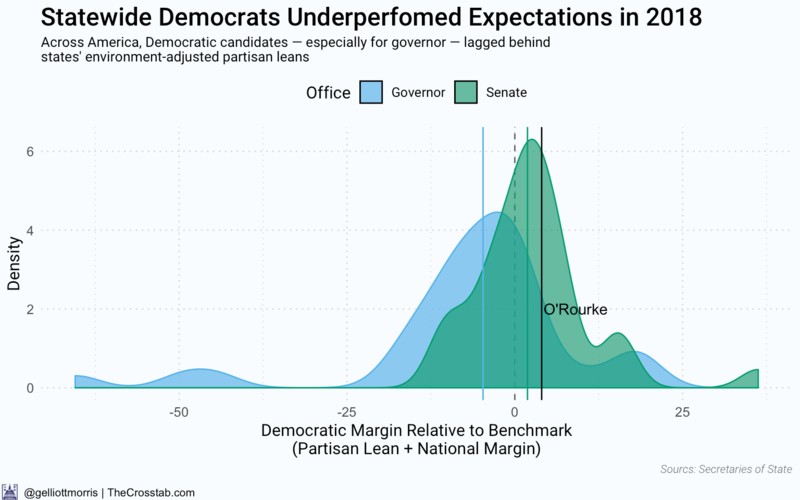 Rather, I’m pretty sure that we’re under-rating the chance that the 2020 election looks a lot like 2016 — that voters are still pretty locked-in to their Trump-era partisan baseline. The 2016 election could see Trump win closer to all of those who approve of him in the NBC/WSJ poll, perhaps 45% of the vote. In that case, Democrats flip MI, PA, WI and FL back to blue and barely win 270 EVs, but each state (and thus the entire contest) is well within the margin of error. Given that the realistic expectations for a Democratic popular vote certainly do not extend past 60%, and maybe are capped at 55, the probability that Trump wins might be significantly undervalued at his current approval rating. 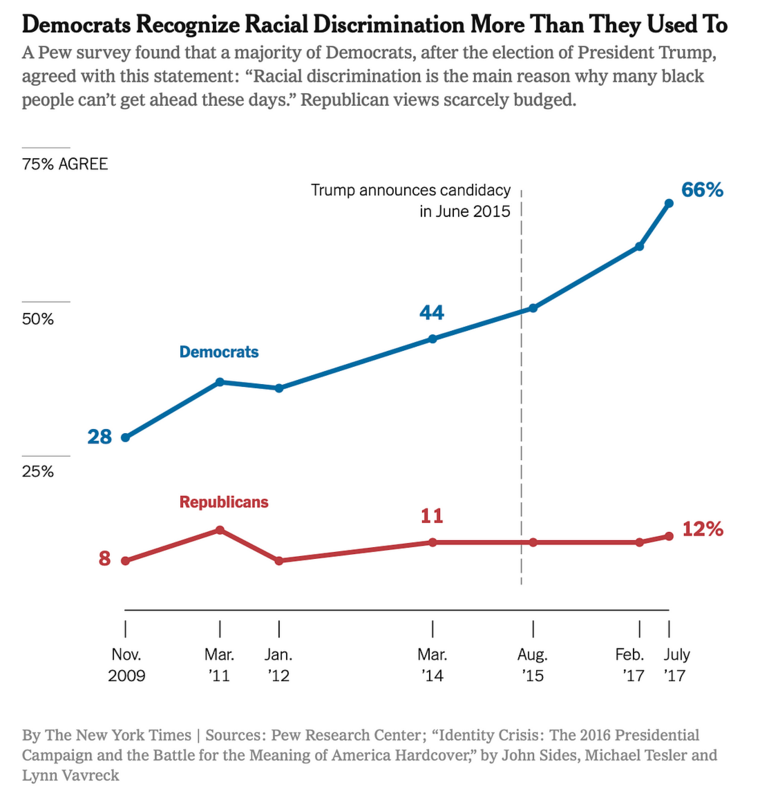 Based on the graph, though, if his approval is any less than 42%, he will have a hard time getting re-elected. 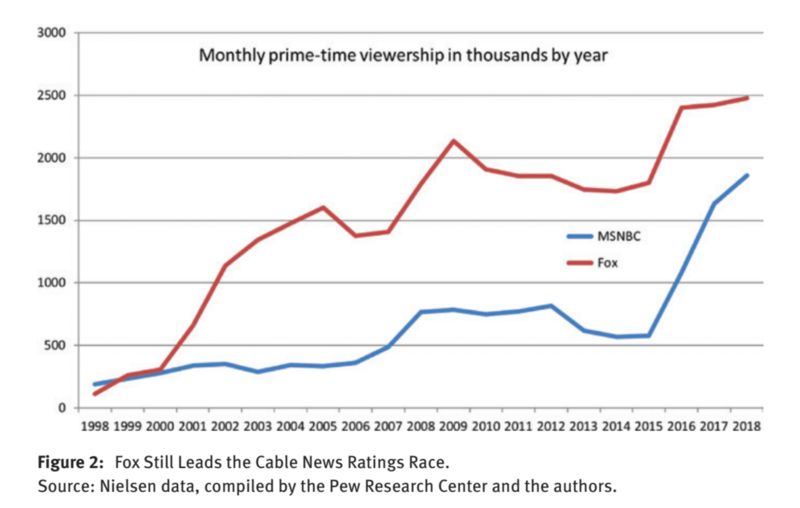 One thing I am confident about is that people underestimate(d) the competitiveness of the 2016 election. 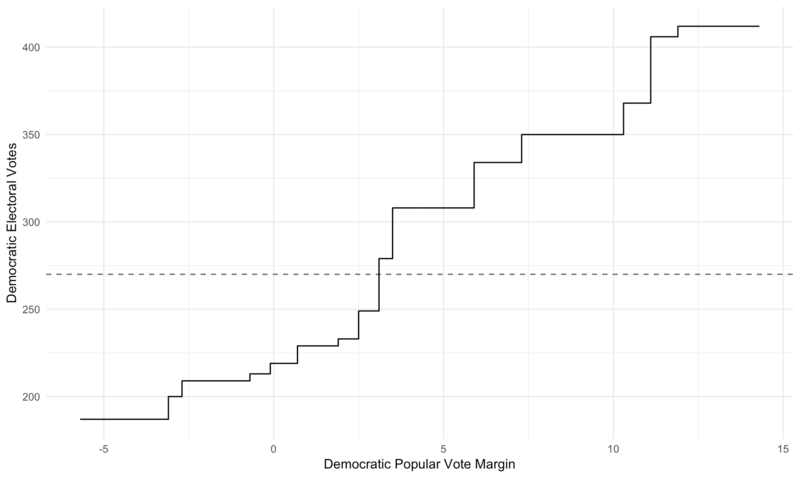 Fundamentals models predicted a toss-up race from nearly the beginning, the surge right among white non-college educated voters started showing up in polling as early as 2014. Of course, this is easy to say in hindsight. My point is more that 2016 was so close that even a 4 percentage point shift toward the Democrats wouldn’t put them out of the woods — and, unfairly, they’d still be disadvantaged in the Electoral College. 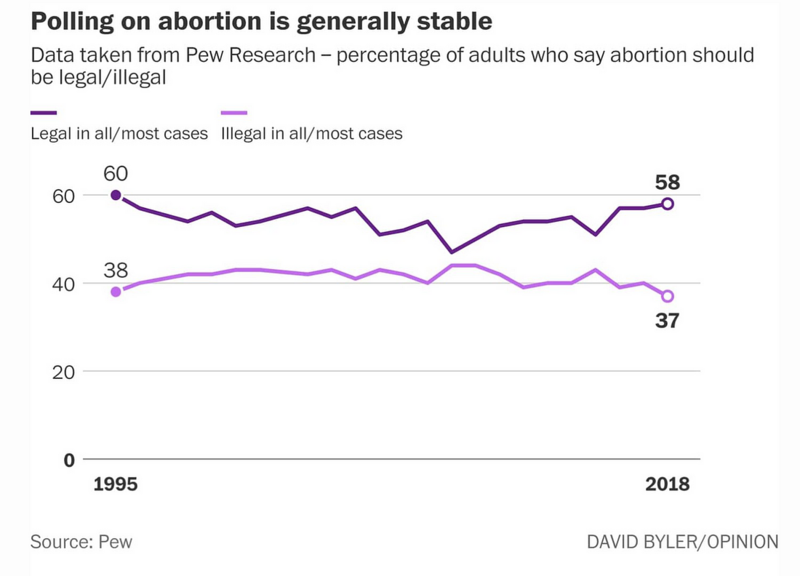 David Byler (WaPo): A new poll shows a spike in pro-life sentiment. Don’t panic — or declare victory. Paul Waldman (WaPo): Do Democrats really have to worry about the left? Actually, not so much. 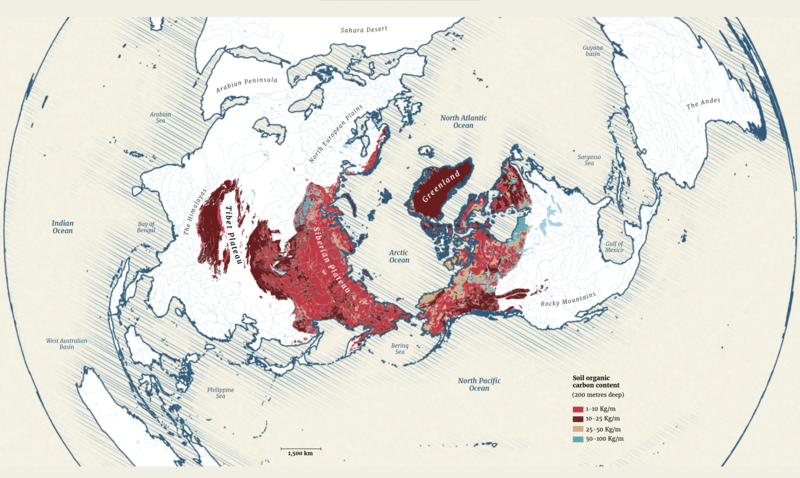 Marco Hernandez and Pablo Robles: What is permafrost and why might it be the climate change time bomb? 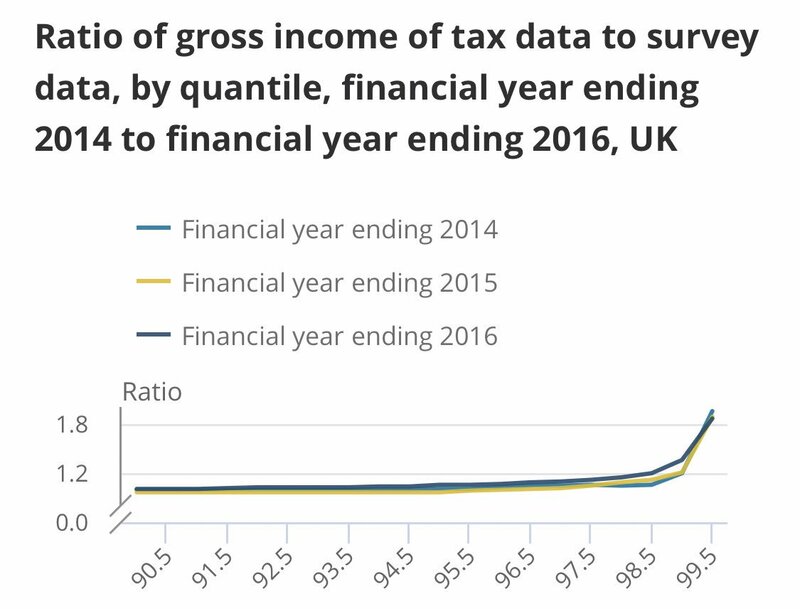 You can see why, here: The very top earners’ incomes are 2x as high when assessed with tax data (more reliable) than survey data (less reliable at the very top end). Lee Drutman (Vox): Can Congress fix itself? 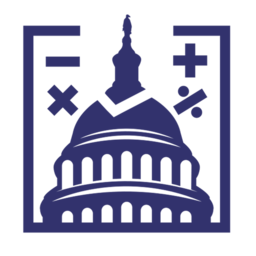 “[…] Any attempt to reorder power in Congress goes up against the problem that those who have power rarely use that power to support reforms that would give them less power. But two things are unusual about today: 1) With one exception (the 1890-1910 period of “czar” rule in the House), leadership has never been so centralized, leaving so many rank-and-file members frustrated and powerless; and 2) the existential uncertainty around the future of American democracy has never been this high. The dysfunctional Trump presidency has put an exclamation point on this, but Congress has been dysfunctional for almost three decades. I’m revisiting some old poli sci books this week, including Cohen, Carol, Noel and Zaller’s The Party Decides. It’s is way too early to be so engrossed in the 2020 election, but hey, I’m not the one who invented the permanent campaign now am I? Thanks for reading. I’ll be back in your inbox next Sunday. In the meantime, follow me online or reach out via email. I’d love to hear from you! Like the newsletter and want to help keep it going? Subscribe today on Patreon for access to private posts and other perks.